Official Tashkent mobilized loyal ministers of religion and ulems [plural for alim, literally a knowledgeable man - Moslem theologian] to further Islam Karimov's policy. 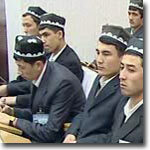 Religious leaders tour the country, meeting with the local authorities, law enforcement agencies, activists, and imams for the purposes of their indoctrination. Ulems' speeches are run and rerun by local TV networks to enhance efficiency of the campaign of brainwashing. Here are some experts from a speech by Abdulaziz Mansur, Deputy Chairman of the Religious Administration of the Moslems of Uzbekistan and adviser to the head of the Tashkent Islamic University, on a visit to the Namangan region. Moslems (and particularly representatives of the Khanaphite Mazbah) are very tolerant. We are never aggressive with regard to representatives of other faiths - as required by Islam, Holy Koran, and the hadises that demand respect for other confessions. "Whoever hurts a representative of another religion must know that it is Me he is hurting," one of the hadises states in the name of Allah. Religious canons and secular laws permit representatives of all religions to worship the God and observe rites. In the meantime, nobody has the right to carry on propaganda for embracing a different faith. That's called missionary work which is outlawed. Outlawed or not, it does take place in the regions. Who are these missionaries? They do not represent Judaism or Christianity. It's like different schools of Islam (discounting four major ones). Like these four schools, representatives of Judaism and Christianity object to this missionary activity, but missionaries keep it up promoting some fiscal interests and objectives of their own. Protecting the youth from information religious attacks is of paramount importance. They need the true faith. Faith is ideology. National and religious ideologies are inseparable. Speaking of ideological matters, our respected president always emphasizes that "this is not a state ideology, it is a national ideology. Our state does not intend to enforce its ideology the way the Soviet power did once." We hear the words "hijrat" (immigration) and "immigrant" all too frequently. The international community is laboring under a misapprehension. Sure, some people do depart the country for different reasons. We may divide them into two categories. Some people were forced to immigrate because of the prosecution of the ulems and the wealthy in the Soviet Union. Whoever failed to leave or couldn't do so for some reason remained here. They were persecuted and branded as "kulaks" and "basmaches" [enemies of the Soviet power] - as we all know. The people who did leave, their immigration was actually the last option, a means of escaping with their lives. Their descendants live in Mecca, Medina, Afghanistan, and Pakistan even now. Their action is forgivable. Some people, however, choose to leave Uzbekistan when it was already a sovereign state. They are calling it "hijrat". Whoever claims to have departed because of the difficult situation in the religious sphere, because of the oppression of Moslems, is a liar. That's lies. Had they been oppressed, Moslems wouldn't have been performing the namaz in mosques. Is there anyone who does not let people perform religious rites? Is there an area where people are denied the namaz? No, there isn't. Even if these people are wealthy, what is this wealth compared to the native land? Is there anyone who would persecute people for the proper observance of rites? ... Our leaders, our head of state constantly speak of Moslems. When a country is prosperous, others envy it, its people, and its leader. There have always been envious people. Shall we trust them and their provocations? There are lots of radio broadcasters and other media outlets nowadays (like RL, BBC, and so on) that are always on a lookout for anything to smear one with. I listen to their programs so as to know what they are talking about, so as to be able to answer their innuendo. My answers are simple: that's a lie and a provocation. They will answer to Allah for it one day. Some credulous people in the meantime may take this nonsense at face value. We must explain things to the people, we must tell the people the truth... We must denounce all of that as a lie. Thousands attend mosques, and that makes mosques places where people should be talked to and explained everything. The young are fragile. They have their lives before them, enough time to attend mosques on Fridays. Let them concentrate on school studies instead. It's all right for juveniles to miss Friday prayers. Let them study, let them go to schools. When a child misses his classes for whatever reason (sickness or something), his parents should be worried. How come they are not? They are pushing their own children into an abyss. I'll answer for it to Allah but these parents are sinners. A.Mansur of Uzbek origin was born in the Ferghana Valley in 1944. He got the diploma of the Tashkent Islamic Institute in 1980. Mansur was one of the authors of the book that interpreted the Holy Koran into the Uzbek language - a major teaching aid for the local population nowadays. Before becoming Deputy Chairman of the Religious Administration of the Moslems of Uzbekistan, Mansur was pro-rector of the Tashkent Islamic University.